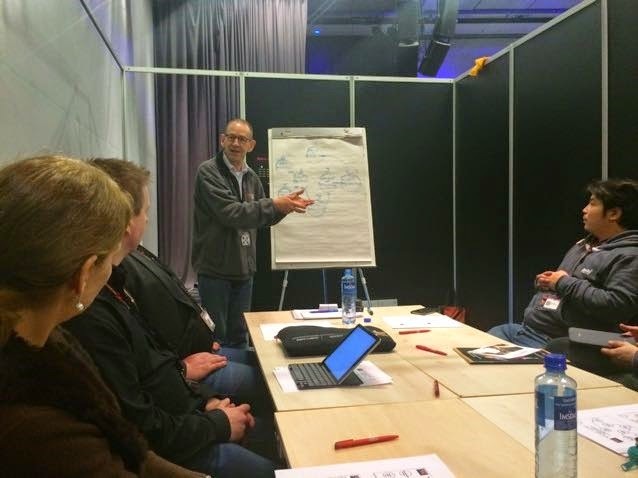 I conducted two pre-conference workshops about ‘Guerrilla IT’ at the itSMF Norway annual event in March 2015. The idea for Guerrilla IT emerged in conversations with itSMF Norway’s Sofi Falberg at a conference in 2014. We spoke about people feeling the need to make relatively low key and informal individual contributions to improving ITSM, possibly under corporate radar. And that’s when I coined the term Guerrilla IT. Then before I knew it, I had committed to delivering a workshop about it in the new Service Bazaar format! 8. Their ‘rebel’s resolutions’ - the takeaways that they could apply at work. I gave the participants the following simplistic depiction of the business (left) and IT (right) to think about. In each workshop, the group was split up into 2 groups of 4-5 people each. In the first workshop, one group was tasked with thinking about the kind of behaviour that IT people should exhibit in their dealings with the business, and the other discussed the desired behaviour from the business. In the second workshop the participants explored another perspective, namely the horizontal divide between the executives and managers who take managerial decisions, and operations (both business and IT). One of the participants called this gap between executives and operations the ‘Rockwool syndrome’, referring to the insulation material. Having no real experience with executives, the ‘executive group’ admitted to having difficulty in getting into their role, and therefore struggled with their formulation of desired operations behaviour. · “Change will not happen unless you can see ‘what's in it for me?’"
Unsurprisingly, the answers to this question varied greatly, depending on the kind of organization. In a military organization there was very little room to manoeuver, while in a more administrative public organisation things were (unconsciously?) very loosely organized. Some organisations were positioned midway. Most participants thought that they were pretty heroic. None admitted to being cautious. Justified deception: One of the participants misled the business by saying that something simply wasn’t possible to realize, referring to complication (and fictitious) technical reasons. Messianic IT: The phenomenon that an IT hero (not one of the participants) gathered a ‘following’ of users who always used his services instead of the regular channels to the department. The downside is that when the hero leaves the organization, much knowledge is lost because nothing is documented (this would undermine the hero’s position). Although the participants thought that the time was well-spent, concrete resolutions for what to do when they got back to work, were thin on the ground. There was a nodding of heads when some people mentioned the reinforcement of how important behaviour is, and the realisation that the business needs to be included in all things ITSM. Some of the references below were explicitly mentioned during the workshops, others I have added after the event.